Dealing with a leaky roof can be extremely frustrating, not to mention that if things are not done properly, the leaky roof can be extremely detrimental to your property’s overall integrity and value. While all roof leaks are problematic, a leak in a flat roof is particularly complicated. Flat roof repair (also known as low slope roof repair) can range from somewhat simple to incredibly complex fixes or even reconstruction that involves complicated insurance claims and experienced professional support. Discovering the source of a leak in a flat roof is usually easier than finding one on a sloped roof or a shingled roof. That said, roof leaks of any kind can be more complicated than they initially seem – especially if you’re an amateur trying to DIY roof repairs. There are many reasons for this, starting with the fact that the spot where you initially notice water entering your interior rooms might not actually be where the leak itself is, since water that penetrates the membrane of your roof can travel across the roof until it reaches a seam in the sheathing/roof deck, skylight or electrical, HVAC or plumbing penetration and then manages to drip or seep through to the inside. Nonetheless, there are steps you can definitely follow to determine the source of the leak, whether or not it is easy to find or readily evident when you first notice the water entering your interior. EPDM, aka Rubber – this is an extremely durable rubber roofing material commonly used in the United States (as well as worldwide) and is made primarily from ethylene and propylene. It has a similar composition to a tire. In fact, one of the largest manufacturers of this type of roofing is Firestone). Modified bitumen – Modified bitumen – this is asphalt roofing made primarily from asphalt combined with a variety of rubbers and solvents that are heat applied with an open flame using torch down roofing. BUR (Built up roofing), aka roofing tar and gravel roofing – The acronym “BUR” means “built up roofing systems” and these roofs have been used in the United States for over one hundred years, and they are crafted from layers of bitumen and reinforced fabrics in order to create a tight membrane. TPO Roofing – this a type of single ply roofing created from polypropylene and ethylene-propylene rubber polymerized together, and installed in a fully adhered or mechanically attached system with a reflective white membrane. PVC roofing – this roofing is crafted from two layers of PVC roof material with polyester between the layers, which serves as a reinforcement. The layers in a PVC roof include additives to make the material flexible, UV stable, and to prevent curing. It is possible to repair small leaks in all of these types of roofing yourself using the appropriate tools and techniques, especially if you have a minor leak and you are rather experienced with DIY repairs in general. Age and condition must be taken into consideration when it comes to attempting a repair. Having said that, if you have any doubts regarding your capabilities, we suggest you find a professional roofing repair specialist who can help you protect your investment. 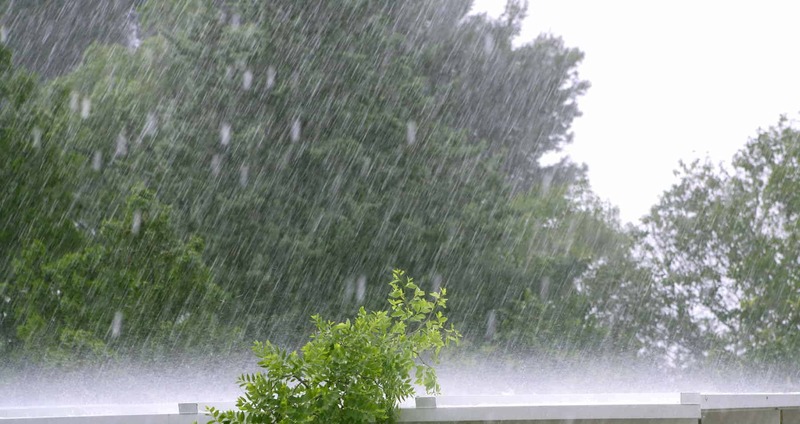 There are a number of reasons why your roof may spring a leak or other roof damage may occur. Natural disasters like hail storms, tornadoes, hurricanes, electrical storms, floods, wind storms, and related severe weather often damage roofing. If you experience one of these natural disasters, inspecting your roof and assessing any damage is something that you should prioritize during the aftermath, even if you do not notice any leaks right away. Finding a leaking roof yourself from the inside of your property is possible, especially if it is a small leak. Start by measuring the distance from the spot where you can see the leak to the nearest two walls, and then use those measurements to locate the leak on the outside of the rooftop itself. Note that the majority of flat rooftops have a slight slope in order to allow for runoff, so you should start trying to locate the leak from the possible point of entrance on the roof, since the water will naturally run downhill. Of course, you should also start by looking for rips, punctures, worn spots, loose or popping screws, separations in the seams, or other issues with your flat roof membrane. If you don’t find any obvious damage, you’ll want to check out the vent pipe boots, the caulk around the vents, flashing, and related structures for holes, damages, or other imperfections. If you do all of this and still can’t locate any leaks, call in a professional flat roof contractor as soon as possible to find the leak(s) and repair them. Having the materials and tools to repair a flat roof is also essential, you’ll need replacement materials and basic tools on hand at the very least – so if that seems overly complex, call a professional to take care of your roof damage issues. A word to the wise – you should always respect heights as well as ladders, so proceed with these DIY flat roof repair tops with extreme caution. Use a ladder that’s well made and in good shape that you know can hold your weight, have another strong adult help you out by holding the ladder steady, and understand your limitations – if the roof that you need to repair is icy or otherwise exceptionally slippery, practice even more precautions or call a professional with the proper equipment. While the choice of repair methods depends on the type of roof that you have, rubber roof patches, rubber roofing materials, and roofing tar may all be involved. Keep in mind that if you happen to have a leak in your PVC or TPO roof you’ll want to work with a company that specializes in this type of work specifically. Things like a leaky seam, holes or rips caused by a fallen tree branch or similar debris, accidental punctures, or other issues with your PVC or TPO roof call for a qualified specialist equipped with all the necessary tools and supplies. They should have access to a roll of appropriate membrane and a heat air gun. Seeking out a company that specializes in PVC or TPO roof repair is your best option in this regard. If you own property with a flat roof, chances are that you have a roof warranty that may range from five for up to twenty years. Accordingly, even if you know you are capable of repairing your roof on your own, it would be wise to call the original company that installed it for repairs if possible. That way, you’ll have legal recourse to recoup your funds and any damages if the repair is not performed properly. Although, if your roof-warranty is up, you can attempt simple repairs yourself, but as always, call in the professionals if you have any doubts or hesitations about performing the work on your own. In fact, hiring a roofing repair specialist is generally the best way to protect your investment. We might be generalizing, but most contractors want you to believe that repairing a flat roof is a waste of time and money. They will likely tell you that once you notice a leak, the damage to the roof is so significant that patching or repairing it will be a short-term fix at best and last less than one year. And what’s worse, water might still be seeping in and causing mold, rot and other major problems. Is your roof generally in good condition? Was the roof damage caused by a natural disaster like a hail storm or windblown debris? Is the damaged area small and can it be easily covered? If these conditions are met a roof repair is probably the best option. However, there is one major condition – the repair must be done properly. If you’re confident in your abilities, you can DIY it – but if you’re not, reach out to a well-reviewed and recommended contractor. When Should You Just Replace Your Flat Roof? If the leaks in your flat roof are the result of age and material break down, it typically doesn’t make sense to repair it. Usually these kinds of leaks start to show up around the twelve or fifteen-year mark on a well-made roof, so if you are experiencing leaks around this time it is perhaps best to look into the costs of replacing it altogether. What’s more, if the initial installation wasn’t performed properly, you may need to replace the roof sooner. Keep in mind that small leaks can be easily repaired, but large or multiple leaks may make replacing the roof entirely the best option. Understanding the costs of various types of flat roofing materials is where you should start when determining whether you repair the roof or replace it entirely. Materials like PVC, TPO, EPDM, or similar materials can be expensive to install even without labor costs. All the same, flat roofing repair costs can be higher than replacement costs simply because repairing the roof usually takes more time and requires more effort. And at the end of the day, there’s a good chance that hiring a flat roofing specialist is the best way to protect your investment. Sometimes even the best professional roof repair team can’t save your roof, which means it’s time to replace it all together. You probably already know that if a building you own has a flat roof, water damage and leaks are your biggest enemies and all leaks must be fixed as soon as possible by an experienced professional roofer using high quality materials.